So Nathan has posted the games. I’m excited for the review period to start, not only to get feedback on my game, but I enjoy seeing what other people produce in these contests. Plus reviewing really helps me, by forcing me to look at games with a critical eye. That’s a skill that I think needs to be honed to improve my design skills. Well, I got my submission in. I titled it Friends or Fortune. Now it is time for some sleep. So I worked out the game board today. The track along the bottom is for the progress of the ship, and the track on the right is for the seaworthiness. I’m really happy that this game ended up with a game board. So the reboot of my game involves having two scores, seaworthiness and progress, that change over time and trigger the end game. Now I was thinking of them simply as numbers that need to be tracked. Seaworthiness goes down, progress goes up. The problem was I didn’t like the feel of just manipulating numbers. Mo, Brand, and Daniel (you may know him as Ice Cream Emperor) helped me to realize that they could be represented on a track that gets followed. The best part about a track is that I get rid of numbers and adding/subtracting them. Instead you simply move a token down the track. This is similar to the scoring in Carcassone, except that Carcassone maintains the actual numbers on the scoring track. 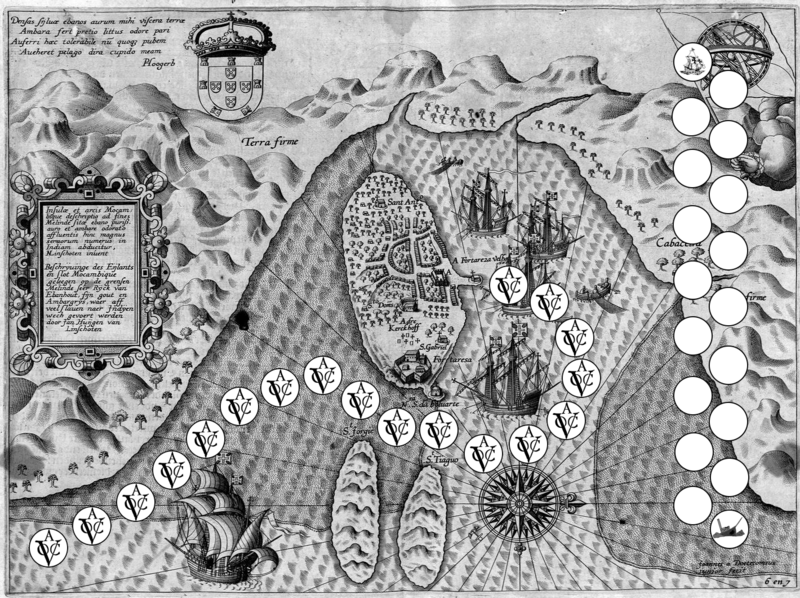 The other neat feature is that people can really have fun with the tokens, like blowing up the scoring track and using Pirates of the Spanish Main ships as tokens. Over on Yudhishthira’s Dice, Brand had a post earlier this month on Gestalt vs. Emergent Play. This post really helped me to get into words some of my own preferences in gaming and desires in game design. I definitely tend to prefer the gestalt elements in games. It fits right into my goals and payoffs. So my as yet unnamed BibliOdyssey game is going to be a very gestalty game, with some small emergent effects for getting to the end game. I’m excited for how it will turn out. It seems late in the game for that, but after some discussion with Mo, about what I consider to be central to my core idea and my frustrations with my current implementation. I may be rebooting the game a little. The core concept of the game remains, but I think my approach to getting what I want may not. For now, I’m going to sleep on it. In 1601, an expedition of five ships set out for the Philipinnes. Only a few weeks into the journey, the expedition encountered a dense fog. Despite their best efforts to keep the ships together, one caravel, the Vrede, was separated from the rest. Determined that they would meet up with the other ships Captain CAPTAIN, decided to press on for the Philippines. Now alone, the ship and its crew struggle for survival. I’m hoping this will help to set the situation and mood at the beginning of the game. Well I’ve got the character creation portion of my game written. I’m moving into the actual system, which is a lot less clear in my head. I figure it will shake out as I write it down. I have a pretty clear idea of what the character sheet and the crew cards look like. I think one of the biggest tasks, besides writing down the system is generating the 24-30 crew cards. I may for the purpose of the competition, reuse paragraphs on the cards and just change the names. We’ll see what happens. As of right now I have far more than I had on Rev/Eng at this same point in time, so I’m pretty confident. So Kylene and I were in the mall and noticed a new store called Teavana. They had all kinds of interesting tea pots and some delicious teas. Staring at all of the tea pots made me think about a game that would revolve around a Japanese Tea Ceremony. I don’t know too much about the Japanese Tea Ceremony (yet), but I know that the structure is pretty rigid, so I think it would be interesting to do the game in the style of Jonathan Walton’s Kazekami Kyoko Kills Kublai Khan and Waiting for the Queen/Tea at Midnight. Of course I have no time to look into this now. I’ve got the Bibliodyssey challenge to finish first. At the end of the 16th century the Portuguese ruled the oceans from Europe to Asia. This would all change when Jan Huyghen von Linschoten published three books containing detailed charts and sailing instructions copied from the Portuguese. These documents allowed his Dutch countrymen to launch a small four ship expedition to Asia in 1594. The expedition failed to show any profit, but it proved that the Portuguese monopoly was broken. In the subsequent years, many more expeditions would be sent to the Far East. Most of these expeditions returned successfully, but the journeys were still full of peril. GAMENAME will help you to create a fictional account of the crew of one of these ships. You will play different members of a Dutch ship, separated from its fellow ships. The journey to the Far East presented many challenges and your characters will confront these challenges. They won’t be alone, they will have an opportunity to bond with the rest of the crew, increasing their chances of overcoming challenges.